Consider making a gift to Sound of the Rockies on #ColoradoGivesDay, Tuesday, Dec. 4. Donor support helps us maintain our world-class a cappella music programs and serve the Colorado community with the gift of song. Contributions fund our youth chorus programs, free community voice lessons, and appearances at events, festivals, and commemorations all over the Denver area. In 2019, we want to take our long-standing tradition of community outreach through song to Normandy, France for the 75th Anniversary of D-Day commemoration. Sound of the Rockies has the distinct honor of having been invited to participate in the Liberation of Europe ceremony in June 2019. We will be the only vocal ensemble representing the United States at the event. The trip to Normandy is a once-in-a-lifetime opportunity to recognize this special moment in history, those who selflessly served our country, and their families. SOR’s goal is to bring at least 70 members of the chorus to Normandy to share the full impact of our powerful a cappella sound. The #ColoradoGivesDay fundraising campaign will help finance member travel and lodging. If you want to continue supporting Sound of the Rockies’ other exceptional programing, make your gift here. 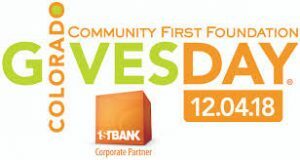 Colorado Gives Day is an annual statewide movement to celebrate and increase philanthropy in Colorado through online giving.